In the area of Digital Cinema no more film reels will be sent to movie theaters. The DCP (Digital Cinema Package) is the replacement for film reels and contains digital film and audio data as well as subtitles for different languages. In order to ensure that every DCP can be shown in any movie theater worldwide, SMPTE and ISO standards were brought to its way under cooperation of the Fraunhofer IIS. All manufacturers, whose devices are compliant to these accepted specifications, will playback standard-compliant DCPs. In order to create a DCP easily, compliant to all these requirements, or to test DCPs subjected to delivery, different software tools were developed by Fraunhofer IIS. The last step in the field of motion pictures productions for digital cinema is the creation of the DCP (Digital Cinema Package). With the software tool easyDCP Creator(+) Fraunhofer IIS offers an easy-to-handle solution for the creation of standard compliant DCPs. This JPEG 2000 decoding solution is created for post production facilities and small-sized digital cinema productions. The decoding is optionally accelerated by a Graphics Processing Unit (GPU) and provides real-time playback of 2k DCPs (2D und 3D) or sequences of J2K images. There is a trial version available for every version of the easyDCP Creator and the easyDCP Player. Choose the respective software in the pick list. The easyDCP KDM Generator(+) enables the creation of so called Key Delivery Messages (KDM) for digital cinemas. A KDM allows the playback of an encrypted DCP for a certain time window on a specific playback device. easyDCP Publisher is a lean, quick and easy-to-use complete solution for the creation of DCI-compliant 2K or 4K DCPs. 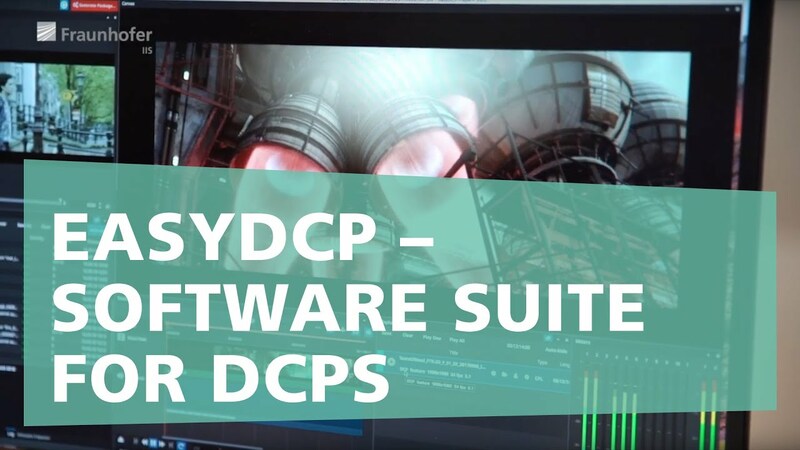 Due to the project-related licenzing model easyDCP Publisher offers the possibility to prepare movies for the playback via Digital Cinema servers without investment cost. For the integration into a post-production environment Fraunhofer IIS offers an API (Application Programming Interface), which can be realised either directly as a fixed program component or as a plug-in version for creating, playing to the final check and coding digital cinema packages - so called DCPs. Visit us at our booth SU4816 at the NAB 2019, 8-11 April in Las Vegas, USA.